The firm Chad Valley began with stationary and in 1897 moved to a Midlands factory called the Chad Valley Works, after the nearby Chad stream. It was here, in 1915 – 1916, that they expanded their range of products from board games to soft toys – including their first bear. 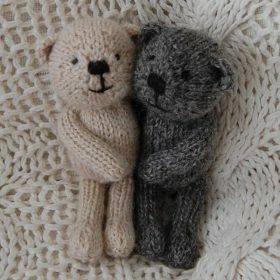 They were soon established making traditional British-style bears. By the early 1930s they were offering fourteen sizes of bear with a choice of hard of soft filling. By the end of the decade they were one of the world’s leading toy manufacturers, and in 1938 earned the Royal Warrant of Appointment as “Toymakers to Her Majesty the Queen”. (After 1953 the Royal Warrant referred to “HM Queen Elizabeth, The Queen Mother”). Like other firms, Chad Valley has moved with the times to adopt new materials and techniques and with such success that in 1960 they celebrated their centenary, and still prosper, although under new ownership. Chad Valley bears with their very British confirmation of a rounded head and a wide, rectangular nose, so characteristic of this manufacturer and in the 1930s-1940s they produced the very successful range of Magna bears. Of similar body shape to their Chad Valley relations, Magna bears feature a distinctive nose design. Rather than vertical stitching, the Magna nose is composed of several horizontal stitches. The range is also distinguished by a blue and white woven, “Magna Series” label.